OK, so working at a research institute called ‘Hers Experimental Design Laboratory’ doesn’t exactly sound cool, but you have to love the thinking behind Jin Woo Han’s high-tech aid for the visually impaired. 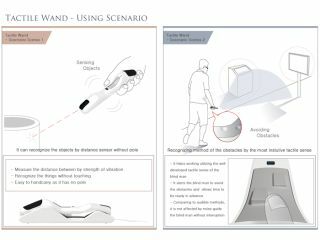 The Korean researcher based at the HEDL institute in Osaka, Japan, has come up with a wireless device he calls the ‘Tactile Wand’ that can be used in place of a standard white guide stick. Using unspecified proximity-sensing technology, his concept design is held in the hand like a cane, but extends only a few inches. Instead of relying on feedback from the stick touching the ground, it senses what’s ahead and either vibrates accordingly or indicates something is there by popping up a button into the user's palm. A step up might be represented by a flick from the button and a sudden jolt, or a shallow dip by just a slower rumble, for example. Jin Woo got in touch to tell us that he isn't sure about making the wand a commercial product, but we'll be sure to let you know if he does.